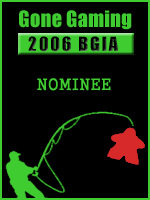 The 2006 Gone Gaming: Board Game Internet Awards nominations are now closed. A big thank you to everyone who participated in the nomination process. You have nominated a diverse range of excellent material. The nominations in each category are listed below. Some nominations were not in the correct category, and I moved these to a more appropriate category. The Gone Gaming staff will now retreat to our secret location to discuss and vote on our picks for each category. The results will be published around January 13, 2006. Good luck to all nominees. Carcassonne as heavy as Tigris and Caylus?! So You Think I Can't Dance? How To Play Doom Like A Girl! Once more into the blocks, dear friends.